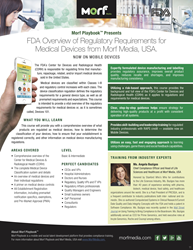 Morf Media Inc., developer of Morf Playbook™ enterprise talent development, skill-building and compliance training platform on mobile devices, today released a new interactive Food and Drug Administration (FDA) Direct training course: Overview of Regulatory Requirements for Medical Devices. The course is essential for owners or operators of places of business that are involved in the production and distribution of medical devices intended for use in the United States (U.S.). Medical devices are classified within Classes I-III and regulatory control increases with each class. The device classification regulation defines the regulatory requirements for a general device type, as well as all premarket requirements and expectations. This course is intended to provide a vital overview of the regulatory requirements for medical devices or, as it is sometimes called, Devices 101. The training on Morf Playbook provides a comprehensive overview of what products are regulated as medical devices, how to determine the classification of an organizations devices, how to ensure that the establishment is registered correctly, and other information on medical device manufacturing regulations. The benefits of expertly formulated device manufacturing and labelling provides regulatory assurance, improves overall product quality, reduces recalls and shortages, and improves manufacturing consistency. The Morf Playbook interactive training on smartphones and PCs is intended for CEOs and VPs, Hospital Administrators, Doctors and Nurses, Regulatory Affairs professionals, Quality Managers and Engineers, Small business owners, GxP Personnel, Consultants and Regulators. Utilizing a risk-based approach, this course on Morf Playbook provides the background and full view of the FDA’s Center for Devices and Radiological Health (CDRH) as it applies to regulations and requirements for medical devices. It provides skill-building and leadership training for regulated industry professionals with RAPS credit. Morf Playbook provides a growing list of courses for 2016 FDA Compliance Training Series with certificates of completion for use toward continuing education units. The courses are individually available and are also available with the complete Morf Playbook training system. With its built-in authoring, reporting tools and analytics to measure an individual’s progress, Morf Playbook provides a complete secure training delivery platform. It provides personalized recommendations for remediation, course progress and completion tracking, exam proficiency and certificates of achievement. For more information about Morf Playbook courses and Morf Playbook platform, visit Morf Media.com or contact Natalia Glatcovschi at natalia(at)morfmedia(dot)com. Morf Media, Inc. is mobilizing the future of enterprise talent development and compliance training with Morf Playbook™ training delivered on smartphones, mobile devices and PCs. Morf Playbook is a patented platform for creating, delivering and tracking training for employees, managers, partners and customers. Global training distributors have adopted Morf Playbook to deliver their proprietary courses via the smartphone to increase reach to professionals on the go. With its rapid course uploading tools with automatic gamification, Morf Playbook delivers interactive training experiences and communications using a variety of media, including audiobooks and video. Social feedback and 360 performance tools empower users to measure and enhance their performance with every project. Human Resource (HR) and Governance, Risk and Compliance (GRC) program leaders use Morf Playbook to boost training effectiveness and reduce training costs by more than 70% with just-in-time interval training delivered via mobile devices.